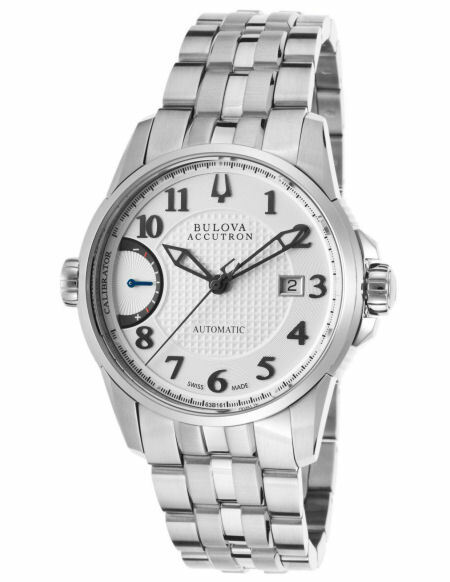 Make a bold statement with this Accutron by Bulova Automatic timepiece. It is part of the Calibrator collection and features a silver-tone textured dial that is accented with black and luminous hands. View precision in action with the 25 jewels swiss made movement. It also features an External Fine Adjustment System (EFAS) with external key. 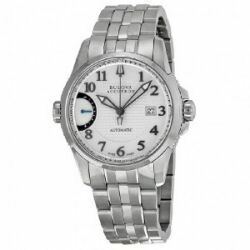 The bracelet is stainless steel and is crafted in five rows with a hidden deployment clasp that makes it easy to manage. Tell time with style by owning your very own Calibrator today. SHIPPING: Shipping and handeling is $20.00 within the 48 continental United States. An additional fee of $25.00 will apply for delvery to Hawaii, Alaska, Puerto Rico, and Canada. We will be unable to accomidate deliveries to any international destinations.